The human body is quite amazing. But its ability to produce body hair is one of those things most of us wish would fall out of the gene pool. And yes, this is something that applies to both ladies and gentleman. After all, hairy backs and legs aren’t exactly at the top of anyone’s dating preferences. So what should you do? Shaving becomes troublesome after the first few tries and epilation downright hurts. And let’s not even get started on the fees for laser hair treatments. So in comes IPL hair removal to save the day! So today, let’s take a look at the best IPL hair removal devices the UK has to offer! 1 But first… What on Earth is IPL Hair Removal and How Does it Work? 2 What’s the Best IPL Hair Removal For You? 3 Which IPL Hair Removal is Best? 4 Is IPL Hair Removal Safe or Harmful? 5 Does IPL Hair Removal Cause Cancer? 6.1 Is IPL Hair Removal Painful? 6.2 Will IPL Hair Removal Lighten Skin? 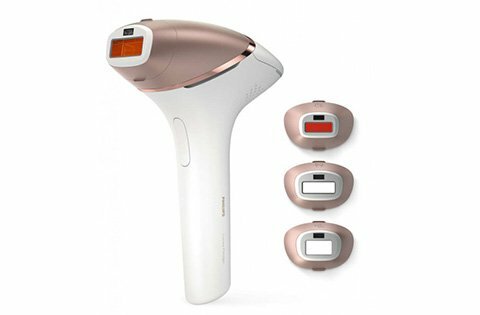 6.3 Does IPL Hair Removal Damage Skin? 6.4 Does IPL Hair Removal Help Acne? 6.5 Is IPL Hair Removal Safe During Pregnancy? But first… What on Earth is IPL Hair Removal and How Does it Work? Keeping things simple, IPL stands for intense pulsed light. As you might have guessed by this point, it’s a form of light therapy for removing hair. Again, it’s pretty simple. The light emits wavelengths between 500-1,200 nanometres into your skin. From here, the light reaches pigments in your living hair cells and kills them with heat. Note that only 20%-40% of your body’s hair is living at the moment. So you’ll need multiple treatments to get it all. But after you’ve completed enough sessions, you’ll notice a substantial slowdown in your hair’s growth rate. In other words, you’ll go from shaving every other day to quick touch ups every other week. What’s the Best IPL Hair Removal For You? Convinced IPL hair removal is the way to go for you? Great! Now you’ll simply need to find the best device for reducing your hair growth. 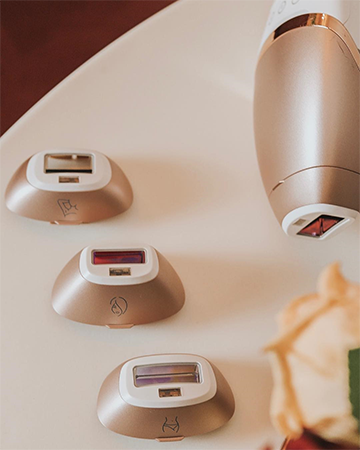 We tested out a handful of systems, and we ultimately found the following five to work as the best IPL hair removal systems on the market! 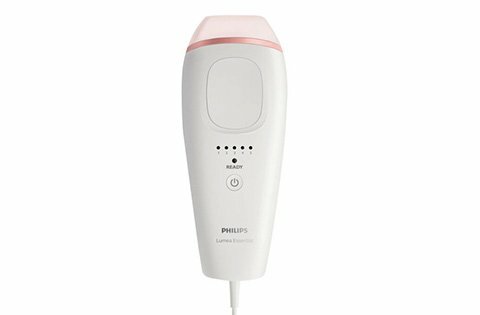 Right out of the gate, Philips sets the bar quite high with its Lumea Prestige. It’s certainly one of the highest priced IPL hair removal devices out there. But quite frankly, you’re getting what you pay for here. And that’s a good thing! First things first, you’ll get 4 attachments with the Philips Lumea Prestige(body, face, bikini, underarms). Overall, we found they really optimised the IPL experience. In short, they really helped us target those fine and finicky areas with ease. Speaking of the actual hair removal process, this device makes the process quite easy. You start with the SmartSkin sensor which works for Fitzpatrick skin tones I-V. If your skin is too dark, this IPL device flashes red and produces no flashes for hair removal. So it’s certainly a nice safety feature built in. Skin tones aside, you can select between 5 different intensity settings. Thus, if you want to ease into the pain, you can start off with the lowest possible setting and work your way up gradually. As far as results go, you’ll notice some hair removal after the first session. However, you’ll need to wait about 5 or so sessions before the hair starts to disappear for weeks at a time. Thankfully, sessions aren’t too long, as each leg only requires about 7 minutes of your time! For design, mostly everything checks out well here. The unique shape is something that’ll immediately grab your attention. Plus, it’s easy to use and hold as well with only 4 control buttons. If anything, this IPL device feels heavy after prolonged use. But other than that, you’ll experience no issues with the design. Plus, the option for corded or cordless use is nice since a dead battery won’t delay your hair removal session. 4 attachments for precise hair removal. 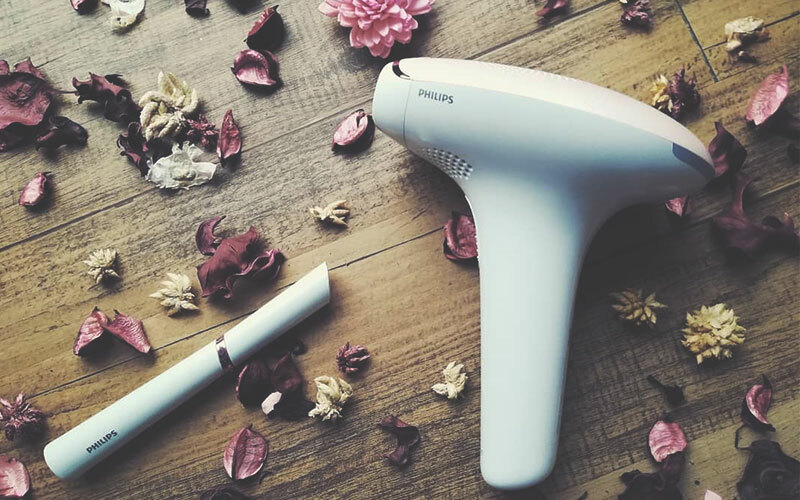 All in all, the Philips Lumea Prestige is one of the best IPL hair removal devices on the market. You’ll see results fast, and you’ll even get 4 attachments for making life easier. Just note that this also happens to be one of the most expensive IPL hair removal systems on the market. Worried about the pain of an IPL hair removal device? Well, worry no more as the Bruan Silk 5 offers a gentle mode to ease the pain. And if that’s not enough, there’s even an Extra Gentle mode. As you can guess, this mostly reduces the intensity to accommodate for sensitive areas like the bikini line or underarms. But if it’s your first time with an IPL treatment, we found the gentle mode to be a great way of easing into it. 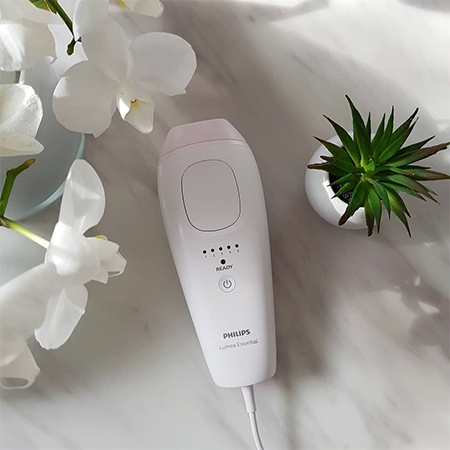 Unfortunately, gentle mode is all you get for dealing with your sensitive areas, as this IPL device offers no extra attachments. So you’ll need to get creative when touching up your face. Especially since the head of this IPL device is quite large. But on the bright side, you’ll get a complete exfoliator thrown in. And this isn’t some cheap extra. 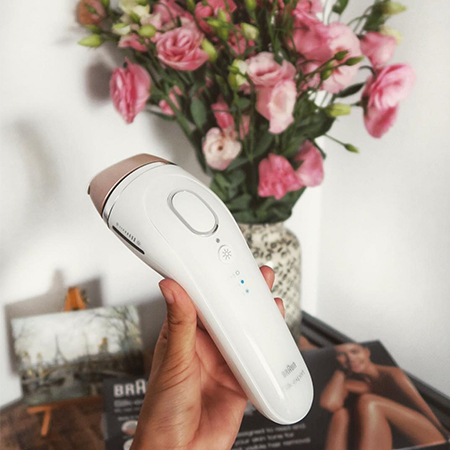 This device does a great job of removing dead skin cells and opening your pores for a smooth hair removal experience. What’s also worth noting here is that this device is quite simple to use. You’ll start with the SensoAdapt skin sensor, which automatically detects your skin tone. And if you fall outside of the recommended I-V Fitzpatrick tones, this device won’t produce any hair removal flashes. So there’s 0 guesswork here as to which setting you should select. Then you start producing flashes over your hair. It’s that simple! Great for first time IPL users. Gentle mode and Extra Gentle mode. Skin sensor is one of the better ones out there. Exfoliator is a great bonus. 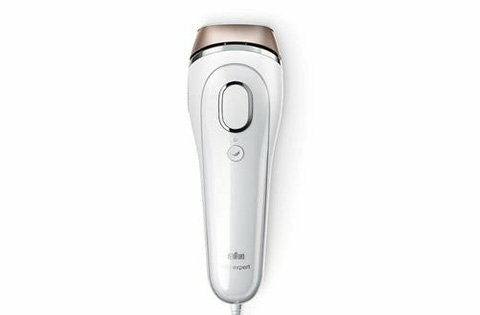 Overall, the Braun Silk Expert-5 is a fantastic IPL hair removal device for sensitive skin. Gentle mode makes easing into your sessions a breeze. Plus, who could argue with a bonus exfoliator thrown in? But it’s a shame Braun couldn’t include any attachment heads to make for better precision on the face and underarms. 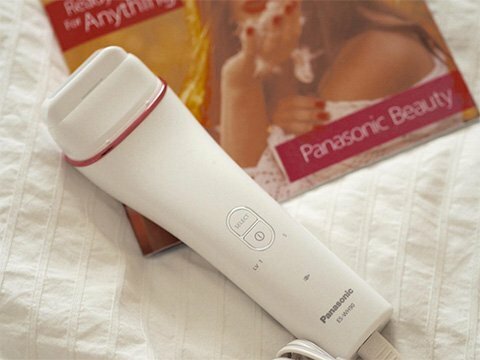 If you’re looking for a solid budget-friendly IPL hair removal system, then Panasonic has you covered. What’s especially nice is that using this device really feels on par to using more expensive hair removers. For starters, it’s extremely lightweight at only 346g. In fact, it’s one of the lightest IPL hair removal systems you’ll find out there. So a 30-minute session never feels too tiring. Also, the head itself offers a 5.4 cm2 of space. Overall, it’s wide enough to target large chunks of hair. But at the same time, you’ll have no problems manoeuvring it over small contours like your underarms. And don’t worry, you’ll get a facial attachment for those ultra-tight areas like your sideburns and under your chin. What’s especially nice here is the five flash intensity settings to choose from. In fact, you can even start at setting 1-2 if you want to ease yourself into the IPL hair removal experience. Plus, it allows for skin tones I-V on the Fitzpatrick scale. So you can customize it to your complexion as well. Overall, the design is great, but this Panasonic device isn’t without its quirks. For starters, cordless is your only option. So make sure it’s fully charged between sessions. Also, this IPL hair removal system will take longer than normal. On average, you’ll need to wait about 3 months to see full results. But hey, it’s more than worth the wait when you only need to shave once a week thereafter! Super lightweight and comfortable to use. One of the cheaper IPL options out there. 5 intensity settings to fit your skin. 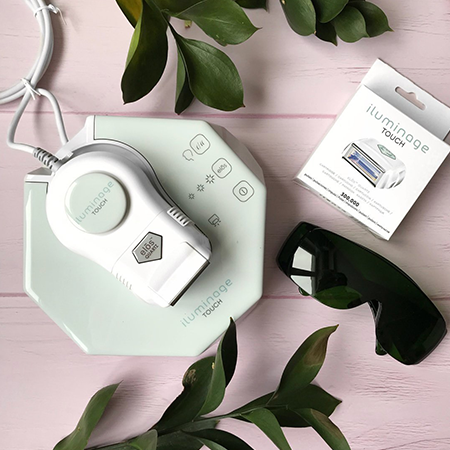 If you’re looking for an ultra-lightweight and comfortable IPL hair removal system, then the Panasonic ES-WH90 is definitely an option to consider! Plus, it’s one of your cheaper options as well. Just note that you’ll wait an extra month or so for full results when compared to other models out there. So far, you might have noticed that other IPL hair removal systems only accommodate for Fitzpatrick skin tones I-V. But what about the darker VI? 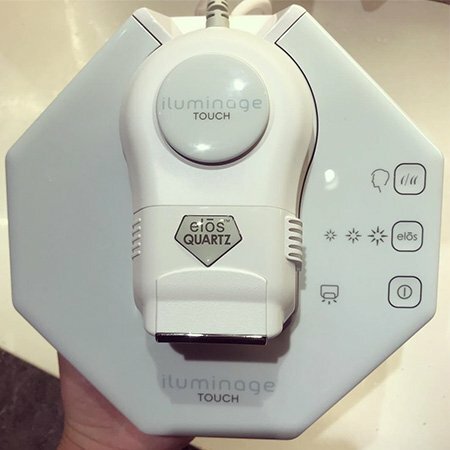 Well, you’re not completely out of luck, as the Iluminage Touch ELOS is one of the few IPL hair removal devices that’ll work for your skin. Also, if you have fair hair (blond, red, dark blond), this is also one of your few options available. Thankfully, none of the above is a bad thing, as the Dual-Wave Technology actually works quite well. Plus, it’s also one of the few FDA-cleared IPL systems out there! So there’s definitely some reassurance here. And as a whole, it takes about 10-11 weeks to take full effect. So it’s definitely on par with other IPL devices you’ll find. Plus, you’ll feel far less pain with this model since it’s less intense in order to accommodate for the darker skin tones and lighter hair colours. But this also means sessions will take longer. In fact, legs alone can take up to 40 minutes depending on your height. So keep that in mind if you’re limited on time. For design, you’ll get something quite unique here. The base itself is especially helpful for storage despite its bulky size. Plus, the lead is super-long and essentially tangle-free. And as an added bonus, you’ll get a precision attachment for your facial area and an epilator! Usable on darkest of skin tones. Usable on blond, red, and light hair. Base included for easy storage. Sessions take longer than other IPL devices. Dark complexions and fair hair have it rough when it comes to IPL treatments. 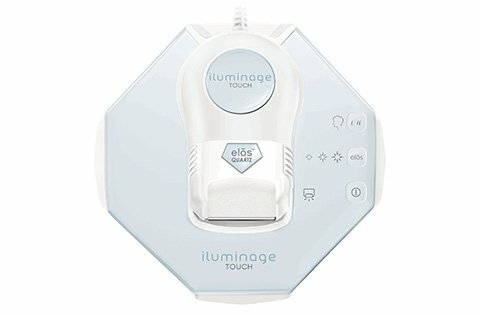 Thankfully, the Iluminage Touch ELOS offers a perfect solution to those problems with low-intensity treatments. Just note that the lowered intensity moves these treatments along at a slower rate than other IPL machines. Are you looking for a super-budget friendly IPL hair removal system? Then the Philips Lumea Essential gives you a respectable option! Overall, you’ll get intensity levels ranging between 1-5 for some options and help easing into this device. Plus, these options allow it to work well in sensitive areas like the armpit and bikini regions. Sadly, this device completely omits any form of attachment heads. For that matter, you’ll find zero extra frills here. 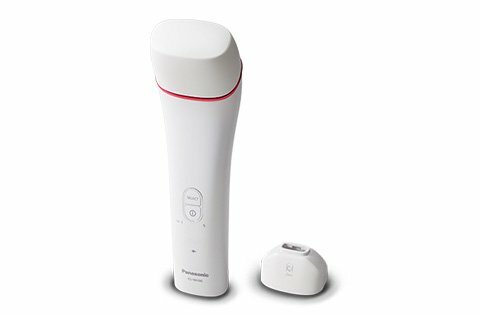 Out of the box, you’ll get an IPL device, an adapter, and a manual. That’s it! Also, note that this IPL hair removal only offers support for Fitzpatrick skin tones I-IV, which is limited compared to other models. It’s also not great for blond, red and grey hair. As far as the design goes, everything checks out quite well here. The device itself is super lightweight at 800g. So it’s easy to use for those super long sessions. Plus, the flash head measures to about 3.2 cm2. So that’s more than enough to cover wide areas of hair. Unfortunately, you won’t get the job done quickly, as this device needs to wait about 2.5 seconds between flashes. So even your legs will likely take upwards of 16 minutes. Slow for areas like the legs. Not ideal for darker complexions. Sometimes, you don’t want a lot of bells and whistles. Instead, you want a product that can get the job done at a great price. And that’s exactly what you’ll get with the Philips Lumea Essential. This budget-friendly IPL device doesn’t come with any flashy extras. But with that in mind, it still does a solid job of removing your hair with 5 different intensity settings. Which IPL Hair Removal is Best? So, you just looked at 5 stellar IPL hair removal systems. And you’re probably wondering how to select amongst them. Surprisingly, the answer is quite simple. Here’s the quick breakdown of how to make your choice. If budget is what you’re most concerned about, then give a second look to the Philips Lumea Essential and the Panasonic ES WH-90. Both of these will offer you a great hair removal treatment without thinning out your wallet too much. However, if you have a dark complexion (VI on the Fitzpatrick scale) or fair hair, opt for the Iluminage Touch Elos. No other product will even come close to removing your hair. Seriously, this is an automatic decision without a second thought! 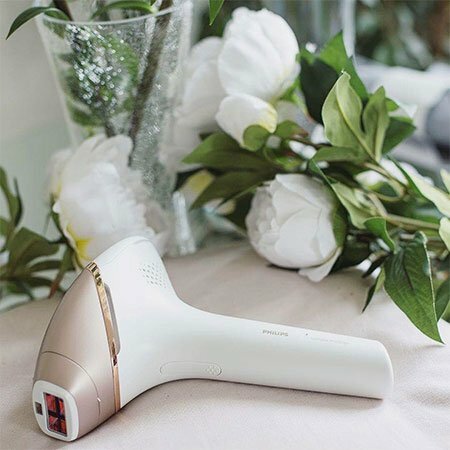 And if you don’t mind splurging in your budget a bit, then the Braun Silk Expert-5 and Philips Lumea Prestige will offer you an IPL hair removal treatment with plenty of cool options thrown into the mix! Is IPL Hair Removal Safe or Harmful? Let’s now address the elephant in the room. IPL hair removal is a relatively new hair removal system. So it’s natural to question its overall safety. The short answer is that it’s perfectly safe for your skin. In fact, IPL treatments will even rejuvenate your skin! You can’t argue with looking younger and refreshed! If anything, try to protect your eyes by wearing any supplied protected glasses. Even sunglasses will work if you have nothing better. Those flashes can get quite bright and even hurt your eyes. Does IPL Hair Removal Cause Cancer? Overall, there’s no UV light involved with IPL treatments like many believe. So with that said, it won’t cause cancer. Well, you’re more or less burning your hair follicles. So yeah, it hurts. However, the amount of pain depends entirely on where you’re targeting. Your back and legs, for example, will feel minimal pain if anything at all. Meanwhile, sensitive areas like your bikini line and neck will hurt quite a bit more. But in all honesty, this won’t hurt as bad as other methods like epilation. Instead, try to imagine a rubber band snapping on your skin multiple times a second. If you can bear that, then you’ll have no issues with IPL treatments. Plus, the pain won’t last for any prolonged period of time. Will IPL Hair Removal Lighten Skin? It can. Even more so if you use IPL treatments alongside home skin-lightening products. But as a whole, you won’t notice any unsightly skin lightening by accident if that’s your worry. Does IPL Hair Removal Damage Skin? You won’t see any long-term skin damage if you do this right. If anything, you might notice some blistering or darkening in areas. But rest assured, it’s all temporary. Just make sure you follow the instructions carefully and use an IPL hair removal system suitable for your skin type. Does IPL Hair Removal Help Acne? If you use IPL treatments on your face, you can actually remove acne scars. So not only are you removing hair, but you’re also improving your skin! Is IPL Hair Removal Safe During Pregnancy? Well, it’s not a good idea. In short, IPL treatments’ effects on pregnancy is not something that’s been heavily tested. But the hormonal changes from the pregnancy are likely to accelerate melasma and other potential skin problems. So it’s best to hold off until your baby pops out! So, you want to know the secret to buying the ultimate IPL hair removal device? Well, not to worry, as buying one is even simpler than the science behind IPL systems. So before you make your final purchase, be sure to check these specs first! Before we even go any further here, you’ll want to identify your skin tone. After all, this is easily the most important piece to finding the right hair removal system for you! Most IPL systems on the market use the Fitzpatrick skin chart for reference. So you’ll want to know where you rank there. Don’t worry, this scale is actually quite simple. The Fitzpatrick chart simply divides skin tones into 6 different categories from I-VI. And in simple terms, the lighter your skin tone, the lower your Roman numeral. Easy enough so far, right? Note that lighter skin tones are safe with most IPL system out there. 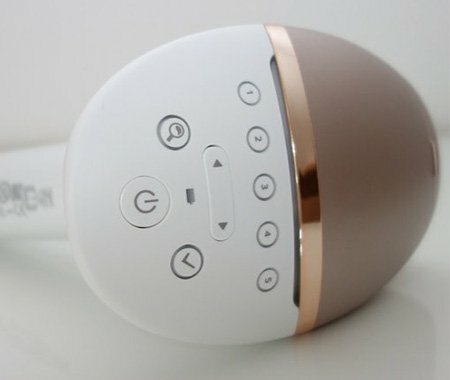 However, some IPL devices will damage darker skin tones. So make sure you’re getting a product that supports your complexion! I: British and Northern European. If your skin has a pale complexion, this is probably you. II: Still European, but slightly darker. Think more in terms of Scandinavian here. III: Southern European. For this one, your skin will have more of an olive tone but still rank on the lighter side of the spectrum. IV: Asian, Latino and Mediterranean. Most IPL devices you’ll come across will safely support up to this level. V: East Indian, African and Native American. This is when your skin tone is definitely on the darker side of the palette. Still, you shouldn’t find too many issues finding an IPL hair removal system that works safely for you. VI. African and Aboriginal. This skin tone contains the most melanin. And finding an IPL hair removal device for this complexion becomes tricky. But not to worry, as it’s not impossible (check our reviews for reference)! While we’re still on the topic of skin tone, let’s not forget that many IPL hair removal devices come with skin tone sensors. These really make life easy by removing a bulk of the guesswork. And if your skin tone and/ or hair colour isn’t supported, these devices will often refuse to flash for your safety! Much like skin tone, your hair colour will play a huge role in which IPL device is safe to use. For the most part, all hair tones work aside from light blond, red, white and grey. But even with that said, you can still find IPL hair removal systems that will support these fair hair colours if you look hard enough. Next, you’ll want to consider which parts of the body you’ll want to become hair-free. Do you simply want silky smooth legs? Or are you opting for the total package? If you’re solely opting for the legs, any IPL device with a large head will do. But if you’re looking to remove some facial hair, you’ll definitely want some precision attachments to make that job easier. For the bikini and underarm areas, you’ll want something that’ll reduce the intensity for these sensitive regions. Seriously, you don’t know pain until you’ve tried to remove hair in your bikini area on the highest IPL intensity setting! It’s no surprise that higher intensity leads to higher levels of pain. So, with manual IPL hair removal devices, you’ll want to start on the lowest intensity level possible to start. From here, ease yourself into it! Also, keep in mind that intensity will impact the speed of your IPL sessions. So once your body adapts to the pain, you’ll want a device with higher intensity settings to speed things along. It’s the classic beauty appliance battle we all know by this point. In the case of IPL hair removal devices, this one remains downright simple. Cordless models will allow you some freedom in where you sit and how you move your device. After all, you don’t have a cord holding you to one spot! But on the other hand, corded devices are quite nice for IPL hair removal systems. For starters, you won’t need to worry about the batteries here. So that means the system won’t power off mid-session—which is super-annoying when this happens with cordless models! Overall, this one’s up to you. But note that many models will offer both, corded and cordless use. So if it fits your budget and skin needs, why not get the best of both worlds? The number of flashes reveals the lifespan of your IPL device before you’ll need to buy a new bulb. Typically, you’ll get 300,000 to 400,000 flashes, which allows for about 5-7 years worth of uses. Often times, IPL devices will throw in cool extras like trimmers, exfoliators, and epilators. And in many cases, these bonuses work just as well (if not better) as the stand-alone versions of the products. As you’d guess, these extras will help your IPL sessions go much smoother. For instance, the exfoliator removes the dead skin and particles that block the light from fully entering your hair follicles. Meanwhile, the shavers and epilators help trim your hair down to make the process go a bit faster and make for great touch-up tools between sessions. All in all, IPL hair removal is the future of grooming. After all, it’s all about working smarter, not harder. And who wouldn’t want to reduce their shaving to touch ups every other week. Overall, IPL hair removal devices work wonders for slowing hair growth. So read through our reviews a few more times. Make sure you’re picking the right device for you!